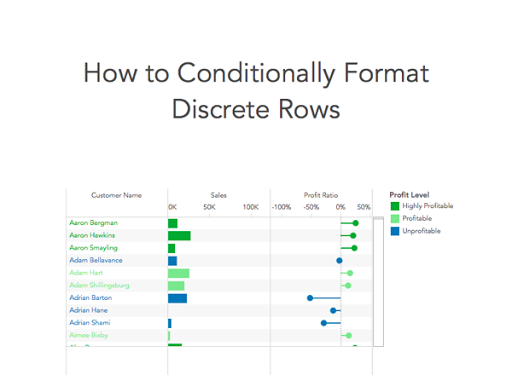 This week’s Tableau Tip is about conditionally formatting discrete rows. Many of ushave used conditional formatting in Excel and we like how we can color-code our discrete items (e.g., customer name) based on a value that’s in the view. In this video, I show you how to do that in Tableau. During the video I reference this blog post by the amazing Ryan Sleeper in which he does conditional formatting for a different use case. Give his blog a follow; it’s great! Exactly! You can't get the labels to left align if you use a Text mark type. The Gantt is a sneaky way around it. Great tip! I realize this post is over one year old, but I have been applying it in a POC, and the major issue I would have with this approach, is that filtering is not working when using it with another sheet. Do you know of any workarounds?